In the United States, tap water is the most tested and regulated source of water you can find. That said, tap water can still contain chemicals you don’t want to consume, cook with, or bathe in, like chloramines, fluoride and even hazardous pollutants like petrochemicals, pesticides or pharmaceuticals. Although many people believe bottled water to be healthier than tap water, the truth is, bottled waters are not subject to nearly the same level of scrutiny and regulation, and the federal government does not mandate that bottled water be any safer than tap water. In fact, the chemical pollution standards for bottled water and tap water are nearly identical, and most bottled water brands are just filtered tap water anyway. Even worse, while most public water utilities are required to disclose their testing results to the public every year, bottled water companies are not required to release their testing data to the public at all, except in the state of California, where a minimum of information is required. So if you buy bottled water, you just can’t be sure of what you’re getting. Extensive research done by The Environmental Working Group (EWG) found 38 contaminants in 10 popular brands of bottled water, including disinfection byproducts, industrial chemicals, arsenic, fertilizer residue and pain medication. The study also included assays for breast cancer cell proliferation, conducted at the University of Missouri. One bottled water brand spurred a 78% increase in the growth of the breast cancer cells compared to the control sample. Separate testing done by the Natural Resources Defense Council also found many contaminants in bottled water. And many brands of bottled water have been recalled due to contaminants like E. coli. It is clear that confidence in the purity of bottled water is largely unjustified, and in many cases the industry may be delivering a beverage that is little cleaner than tap water—but sold at a 1,900 times the cost. Every year, the equivalent of 17 million barrels of oil are used to produce plastic water and soda bottles in the U.S.—not including transportation. Bottling water produces more than 2.5 million tons of carbon dioxide per year. According to Peter Gleick of the Pacific Institute, only about a third of all bottles of water consumed in the United States are recycled, meaning that about two-thirds end up in the garbage—or as litter. Even the minority of bottles that do get recycled are simply down-cycled. In other words, after one more incarnation, they will end up in the landfill (or as litter) anyway. According to the Pacific Institute, it takes 3 liters of water to produce 1 liter of bottled water. Once you add in the water needed to manufacture paper labels and transportation fuel, it actually takes closer to SIX bottles of water to produce 1 liter of bottled water. From creation to disposal, plastic water bottles contribute to air pollution. And many of the chemicals that go into their production continue to leach out into the air and into the water they hold. 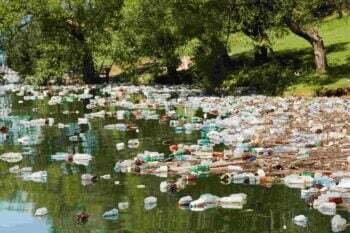 Given the fresh water shortages and droughts happening in the U.S. and worldwide, plus the level of asthma, cancer and other diseases related to the oil and chemicals used to make plastic water bottles, this level of waste and pollution is unconscionable. This is why you should absolutely give up bottled water for good. Why Do You Need to Filter Water? Although bottled water is no cleaner or safer than tap water, no matter where you live, your tap water is sure to contain some chemicals you don’t want to drink, cook with or absorb into your skin while bathing or washing your hands. That’s because the chemical pollution standards for tap water (and bottled water) are relatively lax, and only cover the pollutants and microorganisms that are known to make you immediately sick. Over the last few years, most water districts have started adding chloramines (chlorine+ammonia) to our water. This dramatically changes the landscape of water filtration and purification because unlike chlorine, chloramines are very hard to remove, and they leach metals like copper and lead from your pipes into your water! In fact, research has shown that your body can absorb more harmful disinfectant byproducts from a 10 minute shower than drinking one liter (one quart) of tap water. But chlorine, chloramines and fluoride are not the only things you might have to worry about. For example, the Environmental Working Group spent three years analyzing the results of almost 20 million drinking water tests from water utilities. The good news is that their tests show that local water suppliers meet Environmental Protection Agency mandatory water quality standards 92 percent of the time. The bad news is that they detected 316 pollutants overall in water supplied to various cities in the U.S. since 2004. More than half of the pollutants they found are completely unregulated (like pharmaceutical residues and radioactive particles), and more than 130 turned up in amounts exceeding official health-based guidelines. For instance, every single tap water source they checked was polluted with unwanted chemicals called trihalomethanes. Trihalomethanes are Volatile Organic Chemicals (VOCs) that form when chlorine, a disinfectant added to the water to kill dangerous bacteria, reacts with rotting organic matter such as runoff from farms, sewage or even dead leaves and insects. Trihalomethanes are almost impossible to prevent in municipal water systems, and are linked to bladder cancer, reproductive disorders, and other serious illnesses. One member of this family is chloroform, which the U.S. government considers a probable human carcinogen. The Environmental Protection Agency regulates this chemical family, but EWG believes that many of EPA’s regulations—which are based on a compromise between health risk and costs—need to be much tougher to protect children and pregnant women, in particular. Since VOCs like trihalomethanes can be inhaled or absorbed through the skin, as well as ingested, you definitely want to get them out of your cooking and bathing water. If you are on well water, don’t think you are immune to contamination in your tap water. It’s important to have your water tested regularly because wells can be easily polluted by radon, radioactive particles, excessive levels of naturally occurring fluoride or arsenic, animal manure, pesticides and extremely toxic fracking chemicals. Between drinking, cooking, washing dishes, watering vegetable gardens, brushing teeth and bathing, we can be exposed to far more waterborne toxins than we realize, and government regulations just aren’t tight enough to protect our health over the long term. This is why, even if you buy bottled water (Please, don’t. ), you still must filter your tap water. You can look up the results of the EWG survey for your city here. EWG tested for many contaminants that municipal utilities don’t test for or regulate, so this report is excellent at telling you what’s really in your water. The law requires that the utility provide this report to all its customers by July 1 of each year. You should have received one in the mail. If you accidentally threw it out, you can request one, or you may find a digital copy on the utility’s website. Parts per billion (ppb) or parts per million (ppm) – These are measurements of the concentration of a chemical. Maximum Contaminant Level (MCL) – This is the legal maximum set by federal law and EPA regulations. Pay close attention to readings higher than the Maximum Contaminant Level, or MCL. These violate federal law and regulations. Maximum Contaminant Level Goal (MCLG) – This is a voluntary ideal level set by public health experts to minimize risks. Most of EPA’s legal limits are generally higher than the corresponding goals because regulations must take into account cost and feasibility. Action Level (AL) – If the concentration of a chemical exceeds this number, a water supplier must conduct additional treatment or take other measures. Take a particularly careful look at the measurements for arsenic, lead, chromium-6, and trihalomethanes. Even if they don’t exceed the regulatory cap, they can be linked to serious health problems, even in “allowable” dosages. Once you know what pollutants are in your water, you can best decide what kind of filter you will need to remove them. A good filter will not only pay for itself over time, but, unlike bottles of water, it will also provide you with plenty of clean water for cooking and bathing, too. You can pick up a small faucet-mount water filter or filtration pitcher from just about any big box store, but most were designed to improve taste, and can only filter out sediment, chlorine, lead, and perhaps a few other things. To remove the arsenic, fluoride, trihalomethanes, pharmaceuticals, pesticides and other toxins that are likely to be in your tap water, you will need a much better quality filter. A filtration pitcher or faucet-mount filter (like Pur or Brita) bought at a big box store just won’t do the job. Before you buy a filter, always check the product specifications thoroughly to be sure it can filter out the particular contaminants that are in your tap water, according to the report put out by your water utility company. You’ll also want to assess how often you need to change filter cartridges (and have extras on hand), and any other maintenance the filter requires to function optimally. Some water filters require higher maintenance than others. Remember, a quality water filter will pay for itself quickly, especially if you typically buy bottled water, so it’s worth buying the best quality filter you can afford that will handle the particular toxins in your tap water. 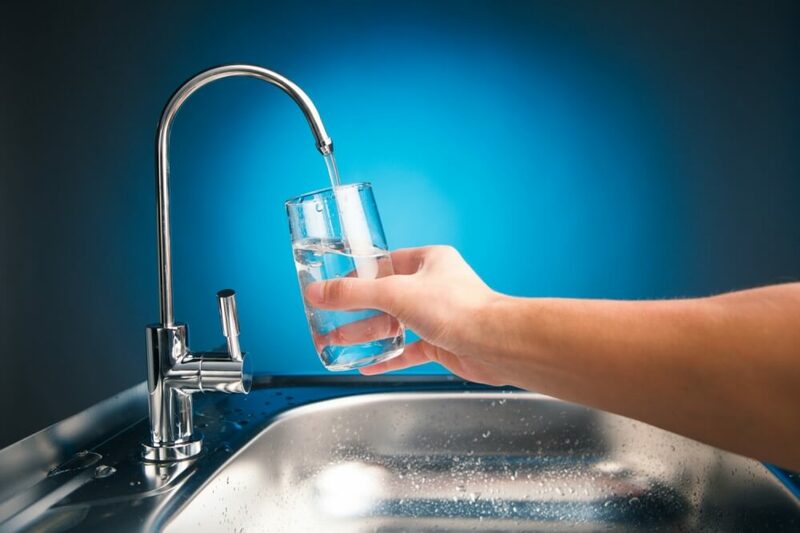 Reverse osmosis filtration systems can be a bit pricey, but they remove fluoride, arsenic, lead, chlorine, VOCs and nearly all other environmental toxins found in municipal tap water. However they can also waste a lot of water, and they can leave water tasting terribly flat, without any beneficial mineral ions. Standard RO systems are not the best choice if you want water that tastes crisp and refreshing right from the tap, but there are some newer systems out there that add the minerals back in. If you use a standard reverse osmosis system to filter your water, make sure you get a product to replace the minerals. This top-of-the-line RO system filters absolutely everything possible, and adds the minerals back in, alkalizing and restructuring the water. It’s probably the very best water filter on the market today, and removes even pharmaceutical residues! This is an affordable, standard reverse osmosis system. During distillation, water is boiled and evaporated away from its dissolved minerals, and then the vapor is condensed and the resulting water droplets collected. This means that while distillers will remove bacteria, cysts and heavy metals very well, they cannot remove gases like chlorine, VOCs and radon, unless they have additional vents and carbon filters included in the distiller unit. Distillers also take both monitoring to make sure they shut off when finished and don’t overheat, and careful cleaning/descaling to function properly. They produce clean water slowly, and can also energy be intensive, since most require electricity to work. Distilled water is an active absorber, and when it makes contact with air, it quickly absorbs carbon dioxide and becomes acidic. Distilled water can also taste flat, so you might want to adjust the pH by adding the healthy minerals back in with a product like ConcenTrace. These filters often require frequent cartridge changes, but can be quite reasonably priced. Though made with aluminum compounds, they do not contaminate your water with aluminum. Activated alumina filters typically only remove or reduce fluoride and arsenic, so you must combine them with a carbon block filter. Together an activated alumina filter with a carbon block can filter out chlorine, most fluoride, arsenic, bacteria, VOCs and more, but cannot typically filter out pharmaceutical residues and certain petrochemicals. Always check the specs on these filters to make sure they can remove your particular contaminants. Here is one of the better countertop brands. This is a good under-sink, 3-stage filter. Carbon block gravity filters remove pathogenic bacteria, cysts and parasites entirely and extract harmful chemicals such as herbicides, pesticides, VOCs, organic solvents, radon 222 and trihalomethanes. They also reduce nitrates, nitrites and unhealthy minerals such as lead and mercury, but may not be able to remove fluoride and pharmaceutical residues. You can pour scummy pond water into a carbon block gravity filter and have it come out safe to drink, making it perfect for camping and emergencies. Carbon block gravity filters are not attached to your sink, and the water flows through the carbon blocks by gravity alone, so they can take a long time to filter. You need to make sure you refill them often so you always have enough clean water on hand for cooking and drinking. This is the best gravity filter available, and this model also has added alumina cartridges that reduce fluoride and arsenic. It also comes in different sizes, depending on your needs. Your skin is a highly permeable membrane that can easily absorb anything applied to it. Bathing every day in tap water that contains chlorine, chloramines, fluoride and other possible toxins exposes you to a level of these chemicals far greater than you could get by drinking them alone. This is especially problematic for children. This is why filtering your shower and bath water is a very good idea. As an added bonus, with the chlorine and chloramines filtered out, your skin and hair will be softer, and you will alleviate the problems many people have with chlorinated shower water, like red eyes and itchy or rashy skin. If you like to take baths, the best way to filter your bath water is to get a high-quality shower filter, and then use the shower head to fill your bathtub. This shower filter removes at least 90% of free chlorine and reduces hydrogen sulfide, VOCs, microorganisms, scale and water-soluble heavy metals such as lead, mercury and iron. It does not remove chloramines. This shower filter is the only one that removes both chlorine and chloramines. It does so by adding ascorbic acid to the water to neutralize them. It does not actually filter out any chemicals. If you want to remove free chlorine, sediment, VOCs, and chloramines, use both of these filters together. Don’t forget about your garden! The chlorine and other chemicals in tap water can kill all the good micro-organisms in your soil. You can prevent this by using a BPA- and phthalate-free garden hose, using collected rain water to water your garden, as well as filtering your tap water at the hose spigot. This garden hose filter removes sediment and chlorine. If you can afford it, it’s a great idea to install a whole-house filtration system. Whole-house filters attach where the main water line comes into your home from the street, so they provide the first line of filtration defense for your water supply. Most whole-house filters cannot filter everything (you might still need a filter at the point-of-use to get things like pharmaceutical residues out), but they can provide dechlorinated water for everything from cooking to bathing to watering the garden. This is one of the very best whole house filters available. This one filters just chlorine and VOCs. Once you know what contaminants are in your water, installing the right filter to remove them can save you a lot of money you might have spent on bottled water, and make a big difference for the health of your family! What Do I Do With My Old Filter Cartridges? Some companies will recycle them, so check with the manufacturer of your filter system to see if they have a program. Unfortunately, given that filters contain all the toxic contaminants that they have prevented you from consuming, spent filters typically need to be put in the trash, even if their plastic housing can be recycled. Though typically not recycled, distillers and reverse osmosis filters are considered to be more environmentally-friendly solutions, because the filter housing is attached to the system and is never thrown away. The cartridges contain significantly less plastic than faucet filter cartridges, so less plastic ends up being thrown in the trash. Despite this, the environmental and economical footprint of bottled water (even when it is recycled) is still much larger than that of filtered water. It would be great if we didn’t have toxins in our water to begin with, and therefore didn’t need to filter it and use all the cradle to grave resources that go into filtration. But until that time exists, there is nothing better for you, your wallet, and the planet than filtered tap water. By investing in a good water filter, you’ll save money, drink, cook and bathe with water that’s purer than tap water or bottled water, and help solve the global glut of plastic bottles. I love all these facts. They helped me on a report on water filters! Thanks Dawn! A water filter is the best way to protect your loved ones from all water-borne diseases. Investing in it is a must for the long-term health of your entire family and benefits of drinking filtered water are many – the major being improved immune system and skin hydration. Really useful article. Thank you, Dawn for sharing it! I agree 100% on the importance of pure drinking water. Thanks for the helpful tips on maintaining the filters as well! The linked 3-stage filter (sediment+carbon block+fine mesh carbon block) seems more suited for decent well water or excessively turbid city water. good for the basics like chlorine chloramine, bio contaminants, voc, thm, and some toxic metal reduction. One very worrying thing about carbon filters is that they are mostly coal based (unless you selectively shop for pure coconut shell based carbon); these apparently are commonly laced with aluminum residues and it is quite typical for the pitcher based carbon gravity filters to impart ~1ppm Aluminum into the filtered water. Whether this contaminant declines as the filter wears in (is highly flushed out) is unknown to me. The other worrying aspect about carbon filters is that the solid carbon blocks which offer higher performance over granular carbon (GAC) are produced and loaded with thermoplastic binders. They need to be flushed and flushed so that there are no filters downstream, for about 10 minutes before the residues of thermoplastic binders become miniscule. You can taste the chemical taste of the thermoplastic binders if you don’t flush enough (1 or 2 minutes); as you continue to flush for more minutes the binder taste goes away as the thermoplastic residue density continues its exponential decay. This is less worrisome to me as long as you have a god long flushing procedure, but if stuff like slight plastic leaching worries you I recommend you get coconut GAC as last stage rather than solid carbon block. They fit in standard 10″ housing, of which I recommend a 3 stage set. Why have you not recommended Alkaway Ultrastream filters? I have never heard of them. There are hundreds of water filtration systems out there. However, upon looking at the Ultrastream, according to their specifications, the filter cannot remove trihalomethanes nor chloramines, two of the most common contaminants in municipal tap water. They also cannot remove fracking chemicals or radionuclides, which are common in California tap water. This system is primarily an alkalyzer, and I would not recommend it for most people’s water filtration needs. You can however connect it to a better filter and use it for its alkalyzing ability. I like the idea of filtering my water, but what happens to the old filter once it needs to be replaced? Does that just get sent to the landfill? Some companies will recycle them, but given they contain so many toxic contaminants that they have prevented you from consuming, they typically need to be disposed of. Despite this, the environmental and economical footprint of bottled water (even when it is recycled) is still much larger than that of filtered water. Though typically not recycled, reverse osmosis filters are considered to be a more environmentally-friendly solution, because the filter housing is attached to the system and is never thrown away. The cartridges contain significantly less plastic than pitcher filter or faucet filter cartridges, so less plastic ends up being thrown in the trash.